It is now recognized that many forms of tinnitus-related neural activity are much more complex and multimodal than ever thought. It has become evident that contribution of non-auditory pathways is involved in eliciting or modulating many forms of tinnitus. Many forms of tinnitus can be modulated by different actions such as forceful muscle contractions of the head and neck as well as eye movements. Somatosensory stimulation such as that from pressure of myofascial trigger points, cutaneous stimulation at specific locations, electrical stimulation of the median nerve and hand, finger movements, and orofacial movements can also modulate or cause tinnitus, as can pressure applied to the temporomandibular joint or lateral pterygoid muscle. This chapter discusses the causes of somatosensory tinnitus and in particular the influence from both head and neck regions on the auditory pathways in individuals with tinnitus. Tinnitus Somatic Somatosensory Central nervous system Muscle Cervical spine Temporomandibular joint. 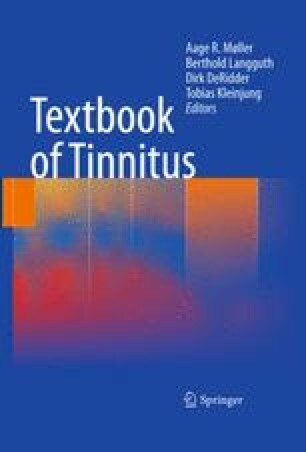 The authors wish to thank Tinnitus Research Initiative for the creation and incentive of the workgroup of Somatosensory Tinnitus and Modulating Factors.